I don’t eat filo pastry often, but I do love it and while I’ve been tempted to make my own whole spelt version for quite sometime, I’ll have to confess that I’ve been terrified to attempt it. Although it’s a simple list of ingredients, it’s a delicate process because the sheets have to be stretched out to form several paper thin layers. So, rather than courageously face my fears, I used the store bought stuff here. I’m imperfect after all and I can live with that. Unfortunately, it’s made with white flour which I normally wouldn’t eat, but I made an exception to share this recipe. If you can find the spelt variety where you live then I would recommend that, and if you happen to live in Italy and find the spelt variety please let me know where you got it. Look for a clean ingredient list of flour/starch, water and salt. Otherwise, make your own if you feel brave, I certainly will try it one day and I promise to share the recipe when I do. For now, let’s focus on the filling. These are somewhat of an ode to my middle eastern heritage, where filo is used quite extensively (baklawa anyone?). They make a great appetizer to a meal or finger food on a buffet table. Yellow onions and fennel are caramelized to bring out their sweetness which is off set by the saltiness of the olives and za’atar spice. They’re perfectly crispy, sweet, and savoury and the sauce adds an element of freshness. It’s like a flavour and texture party in your mouth. Admittedly, this recipe is not quite as “whole food” as most of my recipes and most of what I eat on a daily basis due to the white flour filo pastry yet it’s not so shabby from a nutrition standpoint. Filo pastry is actually a lot less caloric than other pastry since it doesn’t have any form of fat in it. It’s just flour and water. The fat is usually added in the recipe assembly process by brushing butter or oil between the sheets, but the amount you use depends on you. I personally don’t brush any oil between the layers, and just lightly brush the surface to make sure the outside bakes up crispy and golden. If you want that crispy flakiness throughout all the layers you can brush them with some coconut oil, olive oil or butter (vegan, dairy or ghee) depending on your dietary preferences, but this will signifcantly increase the fat and calorie content. The filling itself is quite light in calories and fat with a good dose of fiber and vitamin C. Fennel is an excellent source of vitamin C and a good source of fiber, folate and potassium. It’s also low in fat and great for healthy digestion. Besides adding flavour to almost every savoury recipe known to man, onions are incredibly healing and medicinal. They have anticoagulant properties and anti-inflammatory compounds and help lower cholesterol and blood pressure. They are an excellent source of biotin, manganese, copper, vitamin B6, vitamin C and fiber. 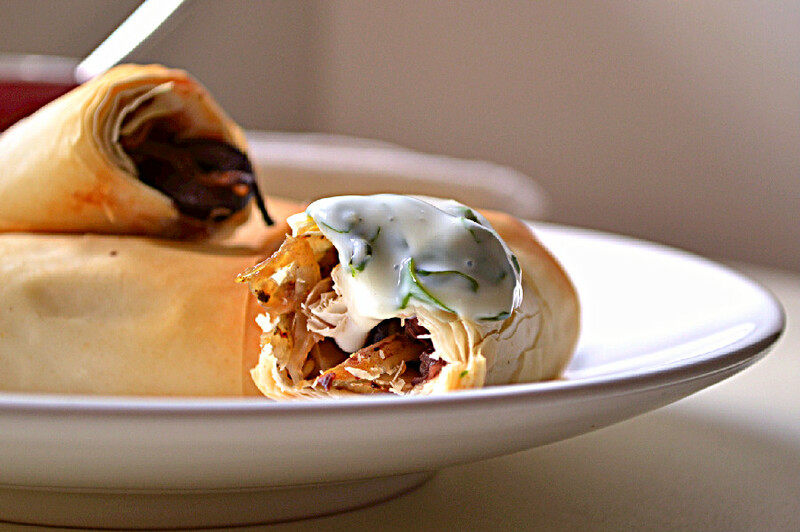 These filo rolls are stuffed with caramelized fennel and onions, black kalamata olives and za’atar spice. They make a great appetizer to a meal, or as finger food on a buffet table. I served them with a minty garlicky greek style soy yogurt based dipping sauce. Preheat oven to 180 C and line a baking sheet with parchment paper. In a large pan or wok, heat one teaspoon of coconut oil until melted. Add onions and a pinch of sea salt and sautee on medium low heat for about 5 minutes until they wilt and become transparent. Add shaved fennel and sautee for about 10 minutes until the fennel has wilted and both the fennel and onion have started to brown. Add maple syrup and continue to sautee until the onion and fennel are well caramelized. Add za’atar spice and remove from heat. Stir in sliced black olives. Divide the mixture onto the prepared filo rectangles and roll the filo into tube/spring roll shape. Place the rolls on the prepared baking sheet and brush the tops and sides very lightly with melted coconut oil (this is optional, but it helps them crisp up and brown). Bake on center rack for about 20 minutes, or until you see that they have turned golden and crispy. Meanwhile, prepare the yogurt dipping sauce by combining all the ingredients in a small bowl and stirring them together. 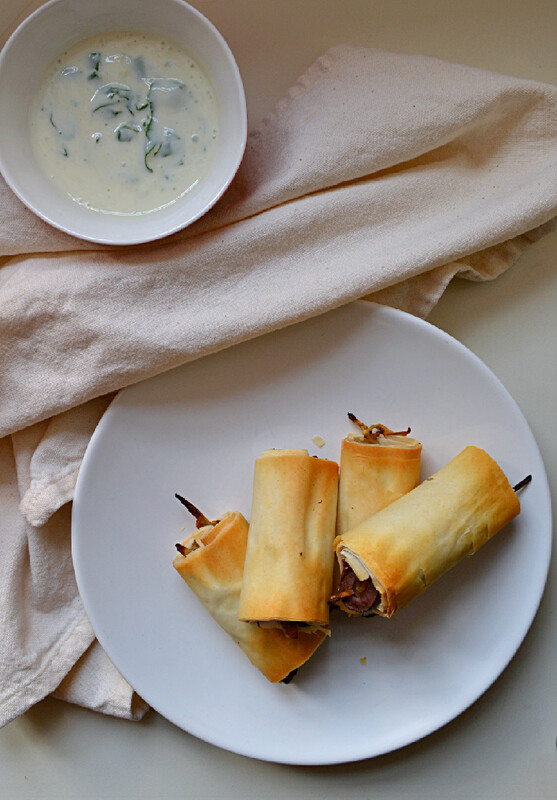 Serve the rolls with the yogurt dipping sauce. Sorry you can’t eat filo. Caramelized Fennel is awesome. You could make the filling and put it into a gluten free dough instead..?